Winter Whites! :) I started it last night and I'm having a blast! 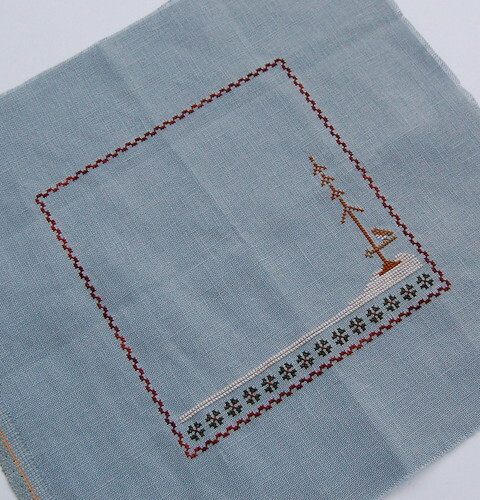 The linen I'm using for it is 32 ct. Misty Blue Belfast. I really love that Family Sampler. I may have to consider buying that kit in the future. And Winter Whites looks fab on the blue. I'll have to make a note of that. Nitro Nicole at it again! LOL they look great! what, it's not on 40ct? jk how do you get all the stitching done with the little ones around? I manage to get some done with my niece here but nowhere near as fast as you. i bow to you girlfriend! Both look wonderful! Great job! I think that I particularly like the look of that red thread on the blue fabric. 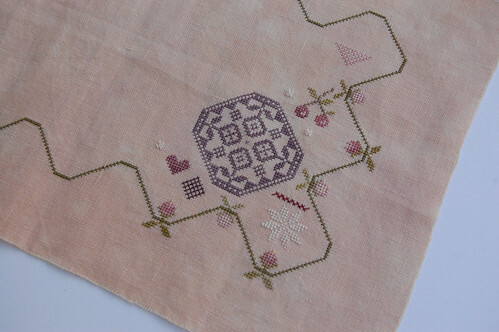 Beautiful WIPs, I just love visiting your blog and seeing your lovely photos! Yay!!! That's part of why I chose that one is because the blue fabric would be a change of pace. I love how the texture of that Belfast is showing up, for some reason. It looks cool. And you just started it last night? *sigh* When I stitch around a 2 year old he's constantly grabbing either my scissors or my floss... or grabbing my scissors to distract me so he can grab my floss. I get nothing done. I'm envious! Heh. Great progress. I'm glad you are stitching Winter Whites and especially on Misty Blue Belfast. I remember someone else stitching it on a darker blue fabric, not sure who now. Mmmm. I like the blue fabby MUCH better for Winter Whites. It really makes it stand out. See what I mean, speedy girl! Both are looking wonderful! I like the blue linen you chose for the Winter design. Nicole, I really like Winter Whites also! I did the bookshelf piece, but deleted a couple of the author names and put in a couple of my favorites. It turned out great. Congratulations on your start of "Winter Whites" - I love the color linen you've chosen! Your start looks great, and the Family Sampler is wonderful. Keep up the great work. LOVE these 2 wips!! And your fabrics are beautiful! Great starts! Your pictures come out so crisp and clear....I need to learn how to use my camera!! Both WIP's are just gorgeous! You are doing a fantastic job on them! Beautiful work, Nicole! You always choose the best projects... I look at some of the charts & pass them over and then see your WIPs and they are must-haves! Lovely work! Ooooh I love the Winter Whites on that fabric. I love the way the border looks. Great choice, and beautiful stitching! I love Winter Whites, beautiful!